When I was told that I could take free Karate lessons at my university, I jumped at the chance. As a born-again believer, I had some qualms about Karate’s rather obvious connection with the pagan religions of the East. Foolishly I brushed these aside for I was having too much fun and was really quite proud of what I was doing. About a month later, I decided to concentrate my study in the Japanese school. I was soon one of the better White Belt fighters in the school (Dojo). I relished the praise of my classmates, and especially that of my Black Belt instructor. He ran his school with iron discipline and took pride in the fact that his club sustained a greater number of injuries than did the “softer” Korean group. There was a fierce Mafia-type loyalty and revenge system in the Karate “family” and they would take up any offense against a member of the group. All the classes began and ended with Zen meditation, just as Christian meetings usually begin and end with prayer. It was a solemn time when we sat in a line facing the instructor, with bare feet and dressed in our Karate garb. We were required to kneel in the Zen mediation stance. This was an uncomfortable position in which we sat on our bare feet with the right foot crossed over the left. One of the higher belts would then lead the meditation saying, “Close your eyes very slowly… now clear your mind of all thought.” After a long pause he would instruct us to picture a still pond, or a turbulent black cloud, or a red dot on a white wall. Each session varied, and some were quite poetic. In each, we would sense a definite unifying force flowing among and through us. My instructor told us that the board and brick breaking he did was active Zen meditation. Only ten percent of the force involved was physical strength. When we first began the meditation and sparring sessions, throughout the entire time I would silently use my prayer language (received seven months earlier). However, as time went on, it became more difficult to pray and finally was impossible. My spiritual life was in a decline which steadily grew worse. From being a fervent witness and Bible student, I became careless and slipshod and never got around to prayer and Bible study. I was always too busy it seemed. I became involved with a girl who was the wrong type of person. Soon I found myself in bars, drinking and dancing to Rock and Roll music. Still I went on, miserable and unfulfilled but not coming back to the Lord. When the girl friend suddenly dropped me, I was jolted enough to realize what a shambles my spiritual life had become. I went home on a holiday and sought out Pastor Worley and began to tell him about the misery and discontent I felt. When he learned about the Karate training, he explained that any form of transcendental meditation lays one open to all sorts of demonic invasion from the occult sphere. He urged that I confess the whole thing as sin and renounce all connections with it immediately. I did this and even brought my Karate Ghi (uniform) and Green Belt diploma to burn. It was very difficult to ignite and burned slowly with a strange green fire. I had some relief but was still filled with tension. By Friday night when I came to the church, I was sick with a very high fever. I kept hearing a voice telling me to go home and get in bed for I was a very sick young man. When the invitation came, I staggered down the aisle, scarcely able to walk. When the pastor rebuked the fever, my legs buckled and I collapsed in a heap on the floor. Suddenly something within me roused up angrily, resisting, and my entire body began to shake as if with violent chills. The next thing I remember is that my body began thrashing wildly and out of control and eight strong men were holding me as best they could. As one prayed in my ear, I felt horribly nauseated and began to gag and retch, my stomach heaving. I kept feeling as if I would suffocate if I were unable to break free. Hatred blazed in me and I heard weird growlings and roarings coming from my throat and mouth. I felt my face change and contort out of shape as the animal-like noises kept erupting through me. They seemed to be coming from somewhere deep in my intestines. Periodically a guttural language would chatter forth from my mouth, raging, and I would feel waves of disgust, fear and hatred for the people who were praying with me—and these were some of my best friends! It was almost as if I were detached, a spectator and observer of what was happening, and not actually directly involved. The demons began to spit in the faces of the believers gathered around. The violence and hatred grew particularly fierce as the brothers showed me Christian love. As love flowed from their very touch, it was as if my whole body was engulfed in flame and burning furiously and the demons screamed with unbelievable volume. It grew more and more difficult to breathe and it was as if I was unable to get sufficient oxygen. As the men called on the demons to leave, my whole body would jerk and shudder. When one or more spirits would shoot up through my throat, shrieking and howling, I thought it would surely choke me to death on the spot. I have no idea how many of the foul things came out, several hundred I imagine. It left me weak, depleted, literally worn out and soaked in sweat from my head to my feet. Over two full hours had dragged by as the conflict raged. Some demon spirits gave their names as they left but many, many others did not. Some I remember were: Shuto, Tyquando, Kung Fu, Lust of the Black Belt, Murder, Lust of the Brown Belt, Lust of the Green Belt, Lust for Power, Pride, Hated, Violence, Fear, Resentment, Depression, Bitterness, Sexual Lusts, Homosexuality, Suicide, Falling from Grace, and Rock and Roll Music. When it was over, I was so weak that it was difficult to even lift my hands to praise the Lord. However my fever was completely gone and I was so tired I just wanted to sleep. When I arrived home, I tumbled into bed and immediately dozed off. However, in the middle of the night I awoke and began to vomit violently, gagging, retching and shaking, as still more hordes of evil spirit left me. This lasted for a long time and then I sank back into an exhausted sleep again. The next day I had a sudden and dramatic repeat performance and a great many more demons left me. I thank the Lord every day for my deliverance from evil spirits and for the privilege of walking with Him. Thank God for a church which ministers deliverance in Jesus’ name! 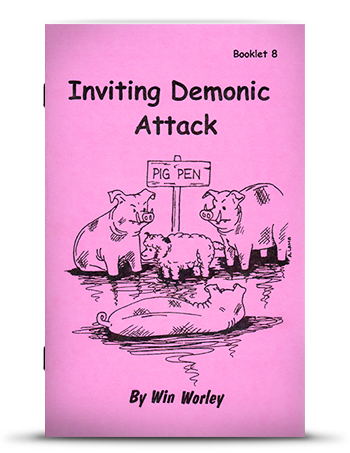 The following is an excerpt from “Inviting Demonic Attack, Booklet #8″ by Pastor Win Worley. Copyright © 1983 by Win Worley, Revised © 1991. All rights reserved. No part of this publication may be reproduced or transmitted in any form or by any means, electronic or mechanical, including storage and retrieval system, without securing permission in writing from the publisher, WRW Publications, PO BOX 9309, Highland, IN 46322.